This year 2016, prom dress trends have moved away from puffy taffeta princess ball gowns to sleek stylish knits, classy chiffon and vintage touch of lace and beads. Prom is a dream come true for just about every girl in school, and it's likely something that you've imagined since you were young. Now that a new year (2016) is almost here, there's no reason why you shouldn't still want to look like a fairy princess and in style for next year's best prom trend. 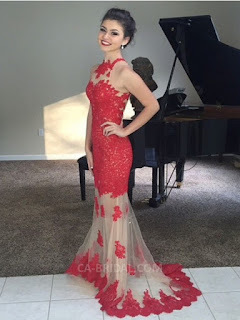 ca bridal online shop collections range in a variety of collections such as Wedding dresses, special occasion dresses, best red carpet accessories, and Prom Gowns that will help you choose the best gown for your dream night. Now is the best time to start shopping and eyeing for trendy prom looks. There is something for prom girls and the sales have started. So here's my top three picks Fast forwarded to Prom 2016 for the biggest prom gowns/ trend. Please let me know your bets via comment below. Lovely lace is everywhere from the runway. Lace has been a popular trend for the past few seasons and has been revamped to a more vintage style lace. The versatile lace dress is a classic staple in every woman's wardrobe and Forever a feminine classic, lace gets even more stylish but like everything in fashion these fun party dresses are constantly in the top trends and are too common to wear for me. 2016 is the year of crop top trend even on red carpet and black tie events. http://www.ca-bridal.com/Canada-Bridal-Store-Wedding-Dresses_c_39375.html is full of pretty gowns, as expected, but also some chic crop top and skirt pairings seen on the red carpet and thought to yourself how chic it is to wear in a formal occasion. So gorgeous and so comfy! ♥ i love your posts so much! So beautiful these prom dresses are! Beautiful pictures! Very nice dresses! Thanks for sharing! Wow. Every dresses look so elegant.